Rachel is the two-time Emmy award winning host of MORE and More Access, the two daily entertainment shows on FOX5. She’s also the station’s movie critic and is a leading entertainment journalist in Las Vegas. 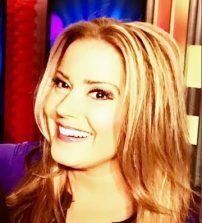 Her RACHEL’S REELS segment is the longest running franchise on the MORE show.. as she’s been covering movie junkets and premieres and reviewing film for 11 years at FOX5. In her more than decade as an entertainment journalist – Rachel has interviewed everyone from Matt Damon to Sandra Bullock and have covered countless movie events like the Cannes and Toronto Film Festival and premieres from Russia to Rio. She’s also covered the biggest entertainment stories in Vegas and has landed dozens of exclusives from JLo to Pitbull to Ricky Martin and the Backstreet Boys. When JASON BOURNE was shooting on the Strip, Rachel was the only journalist in Vegas to get an exclusive interview with star Matt Damon. Rachel is also very involved with several charities including BEST BUDDIES – in which she’s been a buddy to a young girl with Down Syndrome for the past 9 years. She’s also a board member of the Tyler Robinson Foundation. A charity started by Grammy-winning band Imagine Dragons to help pediatric cancer families. She was just recently honored by the band and TRF with the first ever “Legacy Award” for her commitment and dedication to the foundation. Originally from Idaho, Rachel graduated from Washington State University with a double major in Broadcast Journalism and Political Science. She has a twin sister who lives in Chicago and loves being “Aunt Rachie” to her nieces and nephew.